The Newbie consortium wants to contribute to overcoming the challenges of new entrants in farming. Reflecting on new business models and sharing good experiences is one way to reach this objective. However, the Newbie consortium is not alone in its concern on new entrants. All across our involved member states, national steering groups take place and diverse stakeholders reflect on new entrants, their bottlenecks and the challenges. For sure, this dialogue is also relevant at the European level, not at least in the light of the CAP reform. 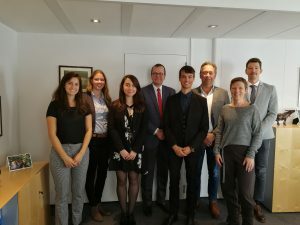 On the 1st of October 2018, a team of the Newbie consortium met in Brussels with representatives from both COPA-COGECA and CEJA. The meeting confirms the need to bundle forces on the topic of new entrants in farming. Europe needs this new entrants, and consequently needs to invest in overcoming the barriers of these entrepreneurs in farming. On the photo (from left to right): Mariana Debernardini (CEJA), Kathrin Muus (BDL), Marion Picot (CEJA), Pekka Pesonen (COPA-COGECA), Mertijn Moeyersons (KU Leuven), Andries Visser (Stichting Wageningen Research), Tessa Avermaete (KU Leuven) and Tobia Capuzzo (COPA-COGECA).